Abstract: Announces the aims of Communication Company. 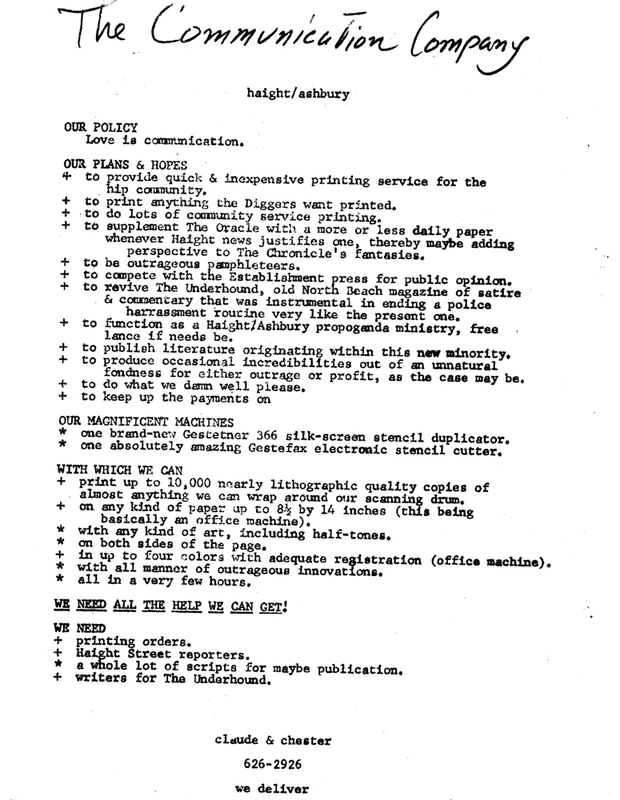 "OUR POLICY| Love is communication.| OUR PLANS & HOPES| to provide quick & inexpensive printing service for the| hip community.| to print anything the Diggers want printed.|.| to be outrageous pamphleteers.|.." "OUR MAGNIFICENT MACHINES .. WITH WHICH WE CAN .. WE NEED ALL THE HELP WE CAN GET! .. WE NEED .. " Signed "claude & chester | 626-2926 | we deliver". + to provide quick & inexpensive printing service for the hip community. + to print anything the Diggers want printed. + to do lots of community service printing. + to supplement The Oracle with a more or less daily paper whenever Haight news justifies one, thereby maybe adding perspective to The Chronicle's fantasies. + to be outrageous pamphleteers. + to compete with the Establishment press for public opinion. + to revive The Underhound, old North Beach magazine of satire & commentary that was instrumental in ending a police harassment routine very like the present one. + to function as a Haight/Ashbury propaganda ministry, free lance if needs be. + to publish literature originating within this new minority. + to produce occasional incredibilities out of an unnatural fondness for either outrage or profit, as the case may be. + to do what we damn well please. * one brand-new Gestetner 366 silk-screen stencil duplicator. * one absolutely amazing Gestefax electronic stencil cutter. + print up to 10,000 nearly lithographic quality copies of almost anything we can wrap around our scanning drum. 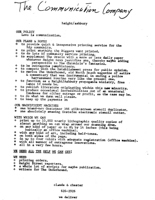 + on any kind of paper up to 8½ by 14 inches (this being basically an office machine). * with any kind of art, including half-tones. * on both sides of the page. + in up to four colors with adequate registration (office machine). * with all manner of outrageous innovations. * all in a very few hours. * a whole lot of scripts for maybe publication. + writers for The Underhound.